This was at the sensitisation workshop on non-violence organised by the Offices of the National Security Adviser and the Special Adviser to the President on Inter-Party Affairs. The 2 joined twelve other Presidential candidates to sign a peace bond in Abuja. The peace pact is meant to ensure that the presidential candidates, their political parties and supporters are committed to peaceful conduct before, during and after the election. 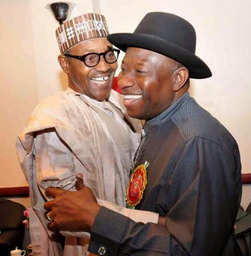 President Goodluck Jonathan is running on the platform of the People’s Democratic Party (PDP) and General Muhammadu Buhari is the presidential candidate of the All Progress Congress (APC) in the February 14 presidential election.